I recently discovered there’s a small chinese super market just up the road from my flat. As with any speciality store there’s a wealth of ingredients you wouldn’t otherwise be able to find, and more common ingredients at cheaper prices than regular supermarkets. After a recent wander round I ended up leaving with lots of fresh beansprouts, bok choi, miso soup and raw/unfried prawn crackers. But what really caught my eye was packs of frozen squid. I grabbed a pack of 4 and walked home wandering what I could do with them. Becky had the best suggestion in the end “Why not do salt and pepper squid?”. We found a recipe, which i’ve since lost, but it wasn’t too complicated and I have faith I can recreate it from memory here. First we defrosted the squid, and scored it diagonally. Quite deep cuts and quite close together, the deeper the cut (without going through, of course) the more “curl” you’ll get when you deep fry it. If you have larger bits of squid like I did then slice them up in to 1″ by 2″ strips, this bit doesn’t need to be exact, take some liberties. The next step was to make the salt and pepper to coat the squid with. Lightly toast equal parts sea salt and whole black pepper corns, then throw them in a pestle and mortar and grind them to a fine powder. You’ll need a big pan of oil for deep frying, at least 2 inches or so deep. 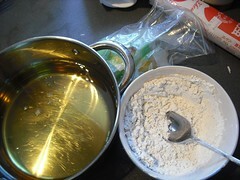 Mix some of the salt and pepper with cornflower to make your coating for the squid. 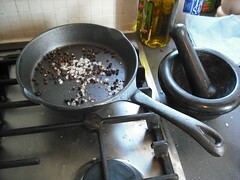 You can get an idea of the ratio of salt and pepper to cornflour from the photo below. Now comes the fun part; Dip the squid in the coating and drop it in the hot oil. Have a slotted spoon to hand and keep an eye on the squid pieces as thy bubble around the pan. From memory it was something like 2 minutes a piece, just spoon it out when it goes golden. Pop it on a piece of kitchen roll to absorb some of the fat. Move to a bowl and dust with more of the ground salt and pepper – no corn powder this time. That’s about it, this dish turned out to be a lot easier than I thought it would be, the hardest part is getting the oil up to temperature. 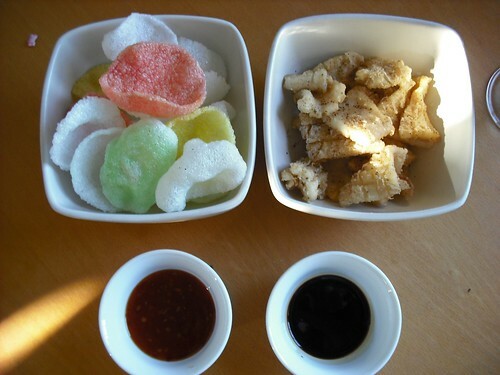 We served the squid up with freshly friend prawn crackers, a soy sauce dip and a sweet chili dip. 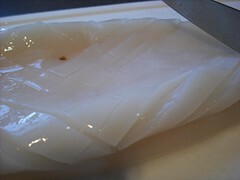 If you can get hold of some squid, fresh or frozen, then do give this a go. Not only is it really tasty but it’s also a lot of fun. This entry was written by David, posted on May 10, 2009 at 5:08 pm, filed under Recipes and tagged seafood, squid, deepfried, snack. Bookmark the permalink. Follow any comments here with the RSS feed for this post. Post a comment or leave a trackback: Trackback URL.